The short par four was restored by Kyle Phillips during his renovation of the AV Macan-Alister MacKenzie design in 2007. The fifth fits into a narrow (50-yard) saddle along the course's property line. The hole runs uphill with out of bounds bordering the right side of the hole. The short(ish) par four is a hole where great players expect to walk away with a birdie but rarely do. The fifth at Cal Club is an example of an architect making the most of the difficult situation by understanding and utilizing angles. Macan and Mackenzie generates the majority of the hole's interest through the clever green. Perched on a knoll and guarded by two fronting bunkers and one in the rear, the fifth green is the smallest on the property. From a straight-on angle, the green is shallow and wide. It slopes with the natural land movement from back-to-front and left-to-right. The green contains a few subtle contours where the day’s pin position and wind direction will dictate the proper strategy to attack the short par 4. Players are presented with a handful of options off the tee. The firm and fast fescue fairways allow long hitters the opportunity to get it close to the fifth green. The first decision to make is whether to lay back or bust driver past the staggered fairway bunkers. The second decision is which side of the fairway to aim at. The green's angle and shallow nature make it advantageous to find the far edges of the left and right sides of the fairway, depending on the pin. This maximizes the impact of the bunkers on both sides and forces a player to play boldly to gain an advantage. The different options to play the par 4 5th. Option A: Little to no risk. Layup short of the right bunkers, which start about 200 yards from the back tee. This will leave a mid-iron approach shot into the tiny green. Option B: Take on the bunkers with a fairway wood. The carry over the first two on the right is 230, and a 240-carry will take the third bunker out of play, which is just off the right edge of the fairway. From this position, players earn a full wedge shot into the green and the ability to attack. Option C: Pull driver and try to get the ball as close to the green while hugging the right side of the fairway. The aggressive play with the driver can yield a great birdie opportunity if executed, but out of bounds lurks up the right. Bailing left will lead to a challenging semi-blind half wedge shot to an elevated green with fronting bunkers… no thanks. When the pin is back left, the play long and up the right side gets even better because the backside contours act as a bowl for half wedge shots. Option E: A layup up the far left side of the fairway of about 225 yards will leave a nice low-iron or wedge approach into the tough green. The left side of the fairway maximizes the landing space of an approach shot to a front-right pin (the toughest on the hole). Option D: Busting a driver past the large bunker on the right side requires a 270-yard carry uphill. The rewards are particularly beneficial for a back right pin. The angle from the left gives enough green to allow for a low spinning wedge shot to take a bounce and stop. Risk comes from pushing the tee shot and leaving a short-sided uphill half wedge shot from the short grass. 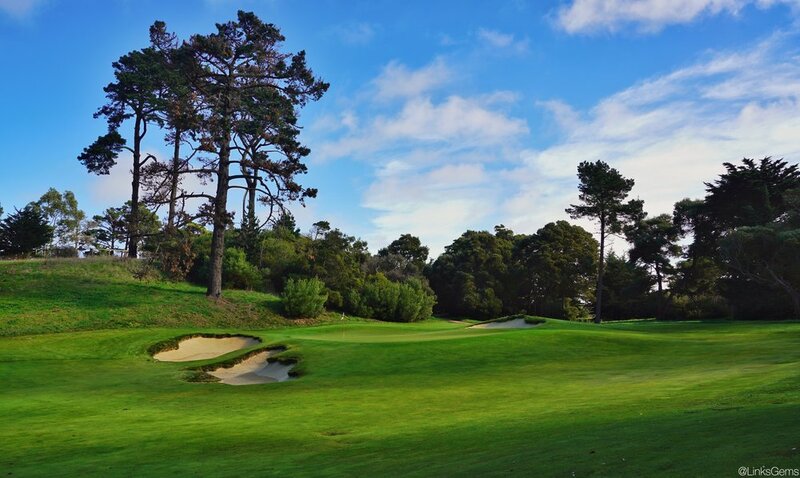 The land at the fifth hole at Cal Club is hardly desirable for building a golf hole. The narrow saddle limited the number of obstacles that the architects could throw at players. The manner in which they exercised restraint and utilized a small angled green complex makes it fun, unique and one of the more memorable on the property.